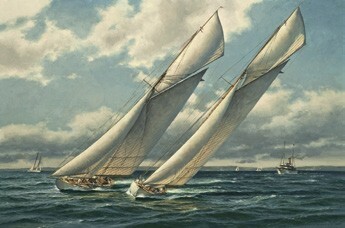 The J. Russell Jinishian Gallery in Fairfield, CT is hosting Marine Masterworks: A World Premier Exhibition featuring 15 new oil paintings by Don Demers, one of the country’s leading marine artists from June 21 through July 3, 2014. The public is invited at no charge to a Collector’s Preview on Saturday, June 21 at 4:30 pm. Don Demers will give a presentation, followed by the unveiling of his new collection of paintings. Specializing in fine marine and sporting art since 1997, the J. Russell Jinishian Gallery is located at 1899 Bronson Road in Fairfield, across from the Greenfield Hill Shopping Center. For more information, call 203-259-8753, email rjinishian@optonline.net or visit jrusselljinishiangallery.com.